The Granite Gurus: Giveaway #5! Limestone Coasters & Rock Doctor Cleaner! Giveaway #5! Limestone Coasters & Rock Doctor Cleaner! 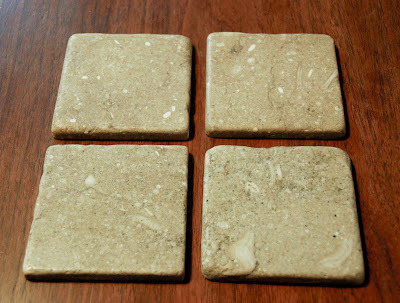 The winner of last week's Giveaway of the Seagrass Limestone Coasters was #12 Melissa. She writes the fun blog Redoing It- With DIY and PSE. This week for our final Giveaway this month, we are giving away a bottle of Rock Doctor Natural Cleaner AND a set of Seagrass Limestone Coasters! To enter just leave a comment here telling me what your kitchen countertops are (laminate, granite, etc) and what city you live in. I'll announce the winner this Tuesday! Post a link to our Giveaway on your Facebook wall, and then leave another comment letting me know you did so. Post a link to our Giveaway on Twitter, and then leave another comment letting me know you did so. Post about our Giveaway on your blog, and then leave another comment letting me know you did so. Good luck! Thanks for playing along with all of our Giveaways this month! Yay! Me! Thank you so much. I'm very excited. And for this week. We have a mixture of Silestone, granite, marble, laminate and whatever is used to make the solid pieces for bathroom counters and sinks. All in Lee's Summit, Missouri. My kitchen countertops are Yellow River granite. I live in Oklahoma City. I'm sad the giveaways are coming to and end! It's been a fun month! And I posted about the giveaway on my blog. We have formica countertops :(. Ugly formica. Sad sad. I have granite countertops. Not sure what name, though, since they came with the house! I have Indian Dakota granite at home in Charlottesville, Va. Though I'm spending a month in Park City Utah renovating a family property and y'all are fabricating granite countertops for it as I type! Worked with B.J. to pick out remnants for vanity tops and a slab from Italia for the kitchen and can't believe how easy you've made the process. Thank you.